Comments: Broadleaf evergreen native to Coastal Florida and South Carolina. Stiff bladed yellow-green to green leaves sprout directly from the trunk. Creamy white bell shaped flowers grow on stalks vertically from the top of the branch. Trunk bark is gray to tan colored. 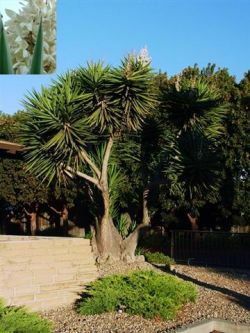 The tree is widely grown as an ornamental and is drought tolerant.